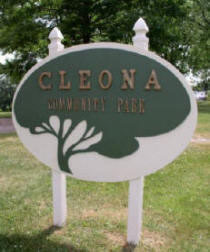 The first playground in Cleona, circa 1930 was located at North Washington Street, along the Pennsylvania and Reading railroad. The land was donated by John H. Long. His son Harry was in charge of development. There were swings, a sliding board and a sand box. John Wolfe, Eugene Boyer, John Laudermilch and Harry “Stump” McConnell helped to maintain the grounds. In the 1940’s, the playground was moved a block west to land owned by John H. Long and part of the Elmer Books farm. Construction of the new playground was a WPA project. It was a larger site with new equipment, a large covered sandbox, tennis courts, a ball field and a kitchen-equipped building. Many activities were held, including daily crafts and games, under the supervision of a summer director. There were also softball, and hardball games and festivals throughout the warmer months. A playground association was formed with Harry Clollser as president. Among his many helpers, Lloyd Laudermilch planted and watered the trees. A ladies auxiliary was formed, with Gladys Blouch Snyder as president. Kathryn Donmoyer and many other mothers worked hard to make it a great place for the children of Cleona. The auxiliary no longer exists; it was disbanded when the new Cleona Playground Park was formed. In 1965, land was purchased south of the Cleona Elementary School building as a new site for the playground, which is operated by the Recreation Department of Cleona Borough Council, with Stephanie Dissinger, President. The new park is well equipped with a pavilion building; amphitheater for movies and concerts; ball fields; tennis, basketball and volleyball courts; a 9 hole miniature golf course; and a variety of playground equipment for all ages. There is a summer program of supervised activities. Many shade trees abound, to make it among the most beautiful small community parks in the area in addition to the Quittapahilla Creek which is a very popular fishing spot for local anglers. Many reunions and town functions are also enjoyed here. Also during the year there are several events held at the park such as the the Police Department’s National Night Out in August, and the Boroughs Annual Fall Festival in October. PLEASE CHECK THE GOOGLE CALENDAR ON THE HOME PAGE FOR INFORMATION ON ACTIVITIES AND EVENTS HELD AT THE CLEONA COMMUNITY PARK AND ALSO AVAILABLE DATES FOR RESERVING THE PAVILLION.